Acellus “Custom” Special Lessons have been reimagined with new features that include a text editor to give teachers greater control when creating lessons right in the interface. 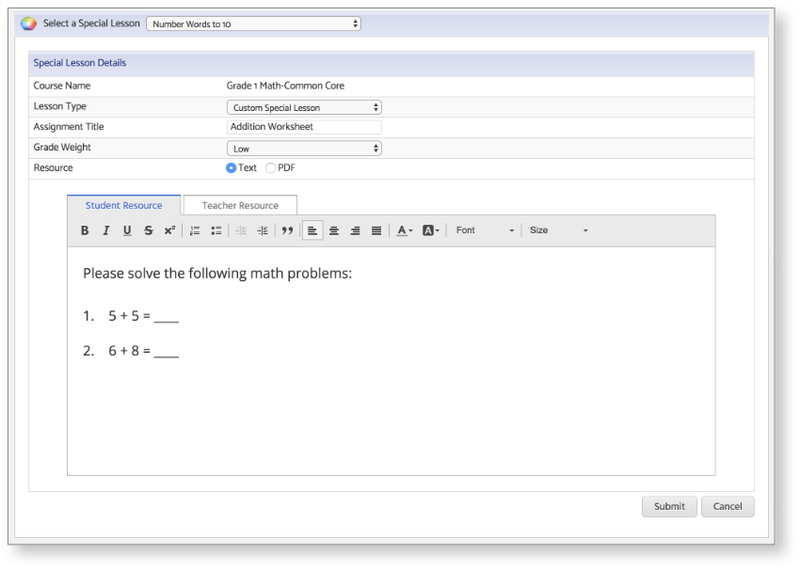 The new features also give the option to provide a “Teacher Resource” for Answer Keys or information for teacher collaboration. Once created, the custom lessons are integrated right into the Special Lessons interface for seamless grading and management. In addition, these custom assignments are then available to ALL classes within the school using that same Acellus Course, so teachers only have to create a custom Special Lesson once. Since these custom lessons are now tied to the Acellus course for the school and not to a particular class, the custom assignments are available to any future classes that use the course, even if the class the lesson was initially created for has been archived. We believe these new features for creating Custom Special Lessons will continue to leverage teachers in enriching the Acellus courses for their schools.